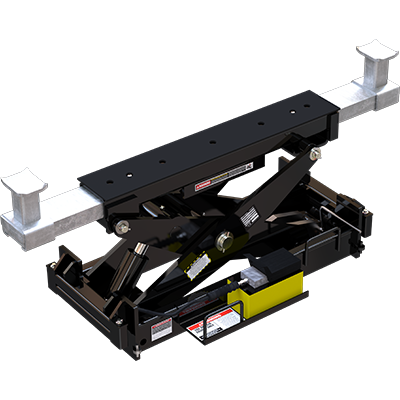 Two RBJ25000 rolling bridge jacks will handle a vehicle up to 22,680 kg. That means these jacks are over-engineered to handle offset centres of gravity on extremely heavy vehicles. Who might need bridge jacks of this calibre? For one, heavy-duty trucks and buses tend to require a bridge jack rated for more than half of the overall vehicle weight. Generally speaking, if you can safely lift a vehicle with the HDS40, you can safely perform wheel service with the RBJ-25000 rolling bridge jack. The point of contact on your vehicle frame is the most important part of lifting. So, we make the rubber contact pads on our bridge jacks hard and durable enough to lift the monsters in your shop. Heavy-duty fleets are no problem for the RBJ25000. All those firetrucks, dumpster trucks, Greyhound™ Buses, etc. have extended lift points and raised chassis. That’s why we include a stackable adapter set with every bridge jack sold. We also recommend you consider the optional truck adapter set, whose frame cradle design ensures heavy frames down shift off the lift pad. A powerful pneumatic-hydraulic power unit creates a dedicated power source for the rolling bridge jack. Two jacks will have separate airlines that can connect together on an airline kit. The foot pedal is air-powered, so a few simple pushes and the jack is fully lifted. Lift to three lock positions for your convenience. The higher the jack, the more undercarriage clearance you get on your four-post lift. Every rolling bridge jack offers premium safety standards at every lock position. The RBJ25000 is over-engineered to easily raise 11,340-kg. (25,000 lbs.) in seconds flat.